So, I've been frustrated with the Pastille dress and realized that I need to do something in between. And actually once I started sewing again, I realized I need to fit the whole bodice again, since I will never wear it, if I just sew it now. Good thing I bought way too much fabric since I bought according to the advice on the book and if I learned something in school about sewing, it was to not waste fabric (it might be one of the deadly sins...). 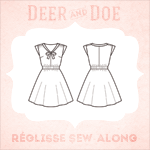 Anyway, I've been reading the blogs lately and noticed that Tilly has a lovely new skirt pattern: Miette. 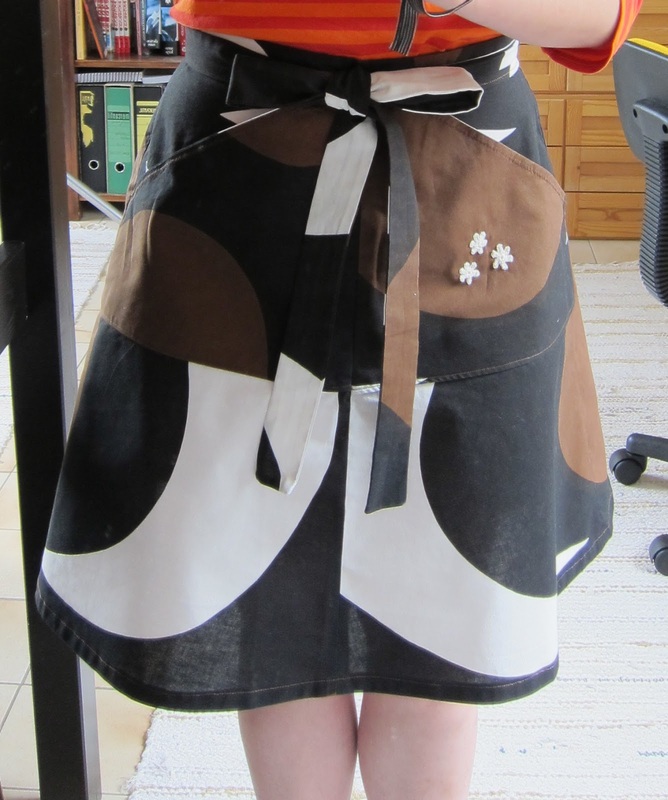 It was supposed to be very easy without buttonholes or zippers and it was awfully cute, so I thought it was perfect. I haven't yet sewn anything since I moved to France, so I wanted to get back into it with something easy and fun. 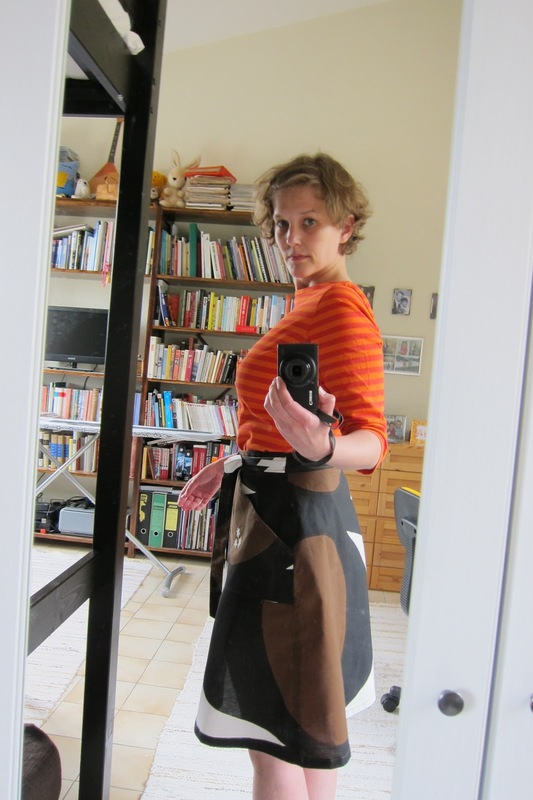 And this skirt definitely was both easy and fun. Although I'm the world's slowest sewer (why does that word make me thing something else than sewing...), so it took me a long time to do this, but hey, that's me. 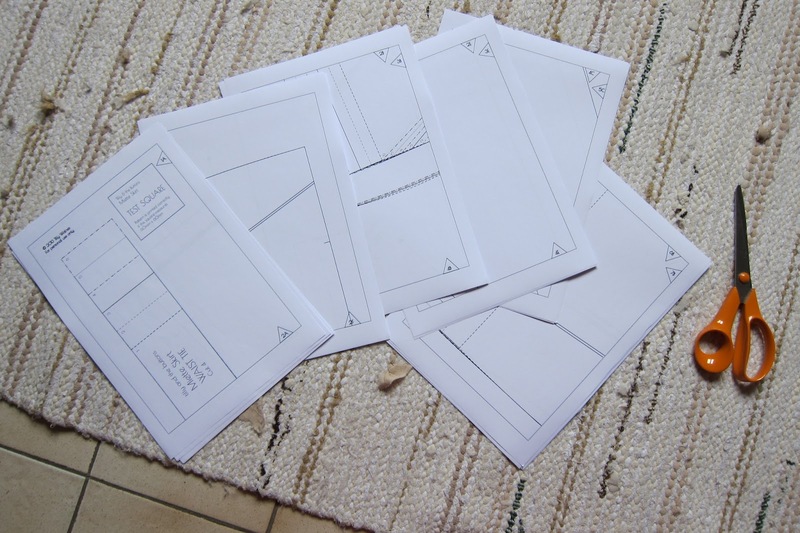 So, when I finally had my pattern, I took my old Marimekko curtains, with the classic "Kaivo" print (Maija Isola, 1964) and started figuring out the cutting plan. It was a bit harder than normal, since I didn't have the real edges any more and the fabric had stretched a bit and also I had to avoid the sunburnt parts of the fabric. I tried (the first time ever!) 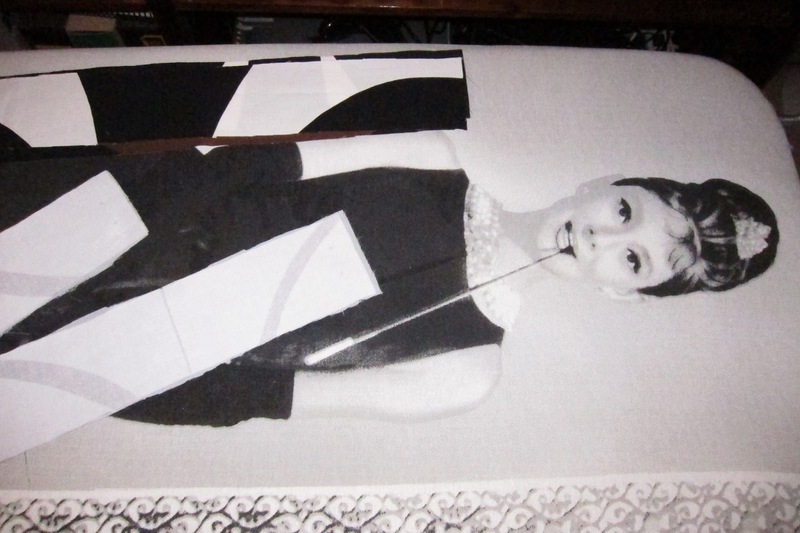 to actually look how the print would match, but I couldn't be too particular, since, you know, curtains. So, I did the best I could. Also first time ever I used decorative stich on anything. We didn't use to have a lot of those in the old machines at school, and the few there was, were never really used, we learned to sew practical things (yes, I know it wasn't the war time). 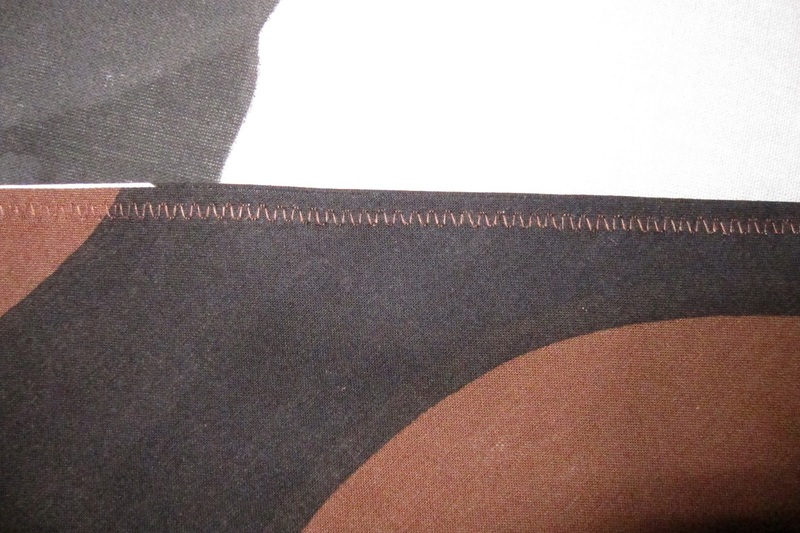 So that part was done to the edge of the pockets. 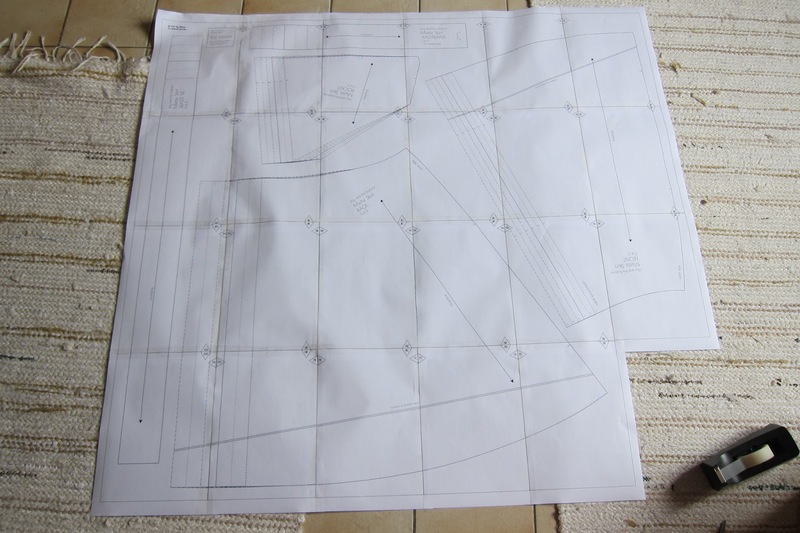 I don't know why I took this picture of the waistband construction, but look at my new ironing board I bought from Franprix. It makes me so happy! Who knew I could ever be happy ironing...? I finally finished the skirt and even wore it to a picnic brunch on the first really warm day of the spring. But of course me being me, I managed to get something (pink?!) on it that doesn't come off. Well, this is not new to me, so let's just cover it up with some decorative crocheting... 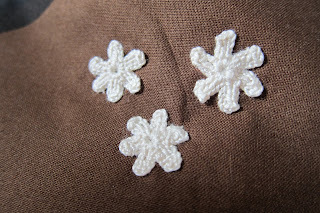 So I crocheted three little flowers and now you can't see the stain! And I think crocheting really emphasizes the seventies look. Wear again: For sure! I'm looking forward to the summer. 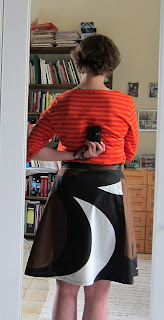 Even if it is a wrap skirt, it's constructed in a way that you don't need to worry about flashing even when it's windy. And yey: pockets! That is AMAZING. It suits a bold print so well - in fact, the wrap skirt is made even more interesting with the use of print. Where does the wrap begin and the print end?!!! It's the prettiest Miette yet! Oh wow, I love it! It works so well in that bold fabric. And yes, great pattern matching! What a fun skirt! Very original, and the flowers finish it off perfectly.